Measuring accurately is essential for baking. Today I am going to show you the correct way for measuring all of your ingredients that go into any baking you do, whether it’s in the Pressure Cooker (Instant Pot), Air Fryer or conventional oven. 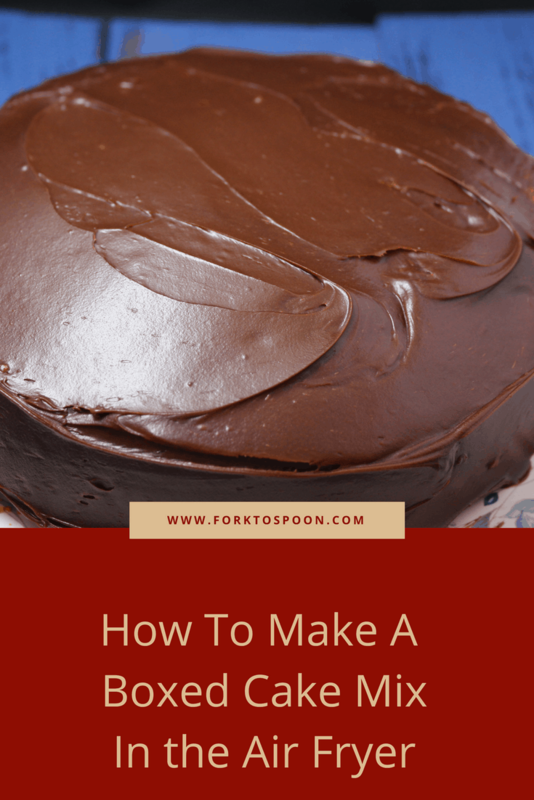 In the next few paragraphs, I will teach you how to accurately measure wet and dry ingredients, which will help you have a successful baking session. If you didn’t grow up baking, then you are probably going to be shocked to realize that measuring dry ingredients and liquid ingredients call for two different types of measuring. Precise measuring for baking is so important because each of the ingredients does a different thing when they are combined, baking soda reacts with the other ingredients and helps the dough item to rise, whether it’s a cake, cookies, brownies or cupcakes. The easiest way to measure dry ingredients is to scoop them in, and then over the sink, use the back of the knife to scrape off the excess. It is important to make sure that when you measuring flour that you don’t pat it down, otherwise you will end up with more flour than you need. What bakers do, is mix the flour before you measure it out, this way it’s not compacted down before you start your measuring. This goes back to what your math classes referred to as ratios since you are creating a chemical reaction. 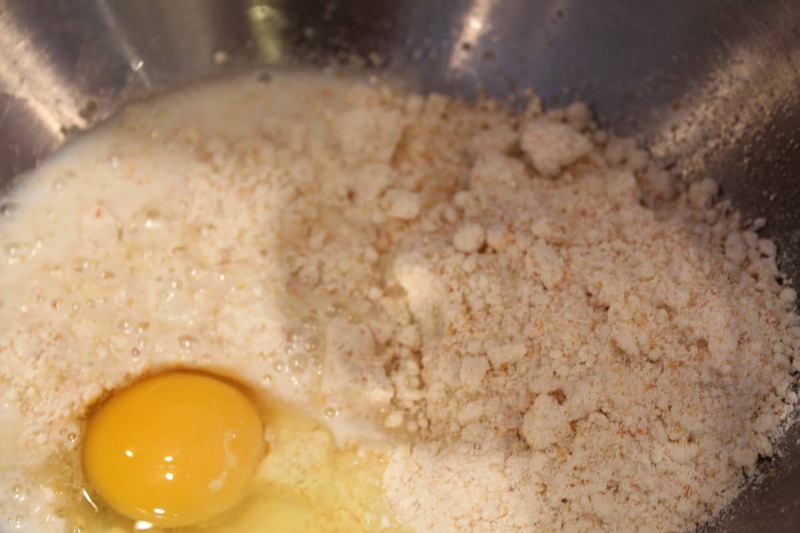 If the recipe calls for “sifted flour” make sure that you sift the flour before you measure it. The opposite is true if the recipe calls for “flour, sifted”that means that you measure the flour and then sift. This is the cake mix, that I found out works best in the Air Fryer. 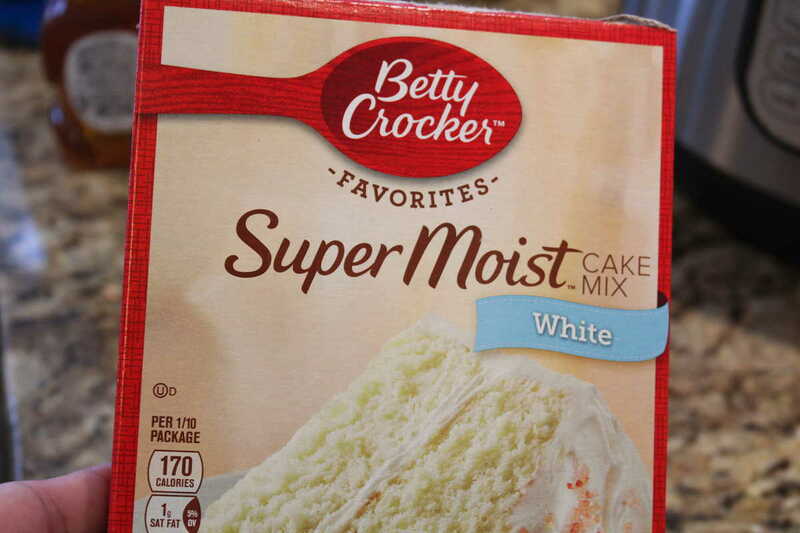 It was really moist, and delicious. Make it, per the instructions on the package. This was the top of the cake. 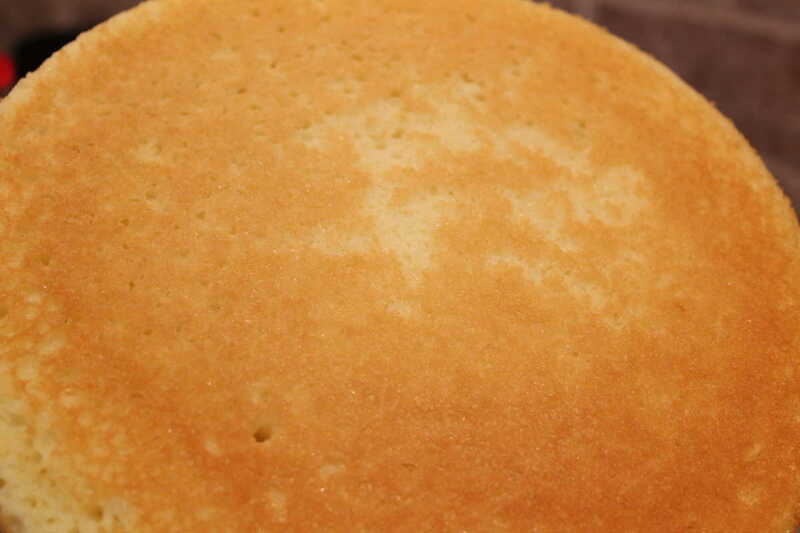 This is the bottom of the cake, notice it’s baked through. Forgive my messy frosting job, it was fabulous though. Make the cake mix, per the instructions on the package. 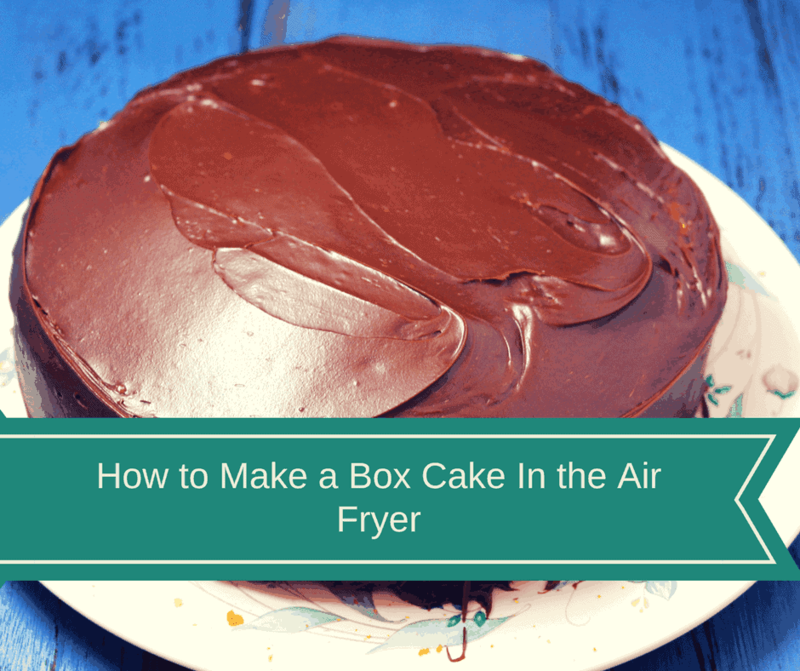 Then set the air fryer safe pan with the cake mix inside of it into the air fryer. 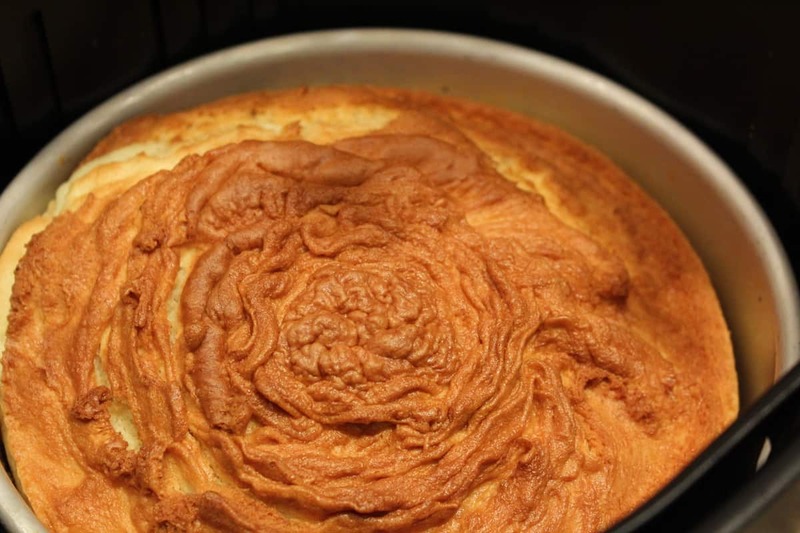 Set the time for 20 minutes at 320 degrees F.
Check the cake is it done? If it is done, pull the cake out and let rest of the counter, for frosting/decoration. If it is not done, add another 5 minutes and check it. Is it done, if not repeat, until the cake is done? Note: The exact time will depend on your air fryer wattage and the size pan you used. 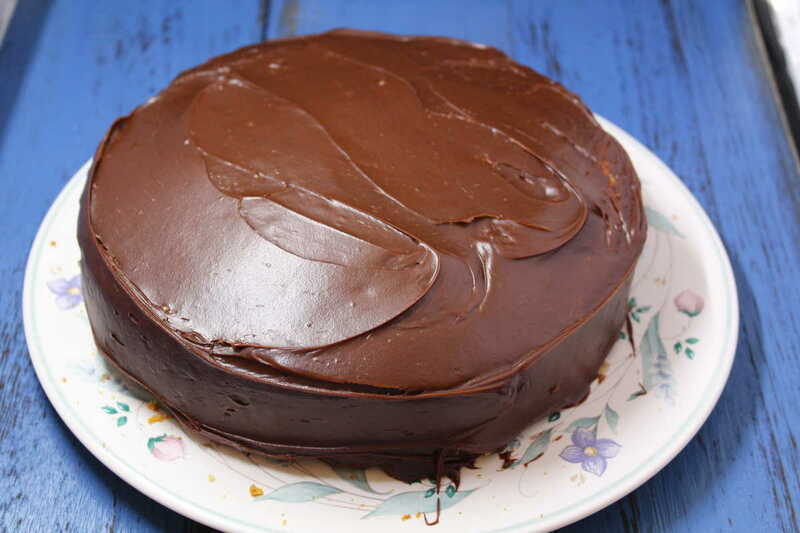 Note: To check the cake for doneness, stick a toothpick in the middle of the cake, if it comes out clean it is done. Remove from the air fryer. Thank you so much! I was a bit Larry about baking which is what I would love to do as regular oven hasn’t worked for a long time. Now I know I can bake! just wondering just white cake mix works best, or any Betty CROCKER cake mix such as chocolate etc . Curious to see how this will turn out. Will try it out. 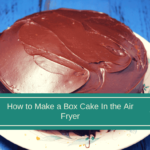 Never heard about making a cake in an air fryer.